Today being St. Patrick’s Day, most people wear some green attire. Be it a shirt, socks, or even a button, people usually dress at least partially to help celebrate the day. I like days like this. It makes picking what to wear in the morning very easy. GREEN SHIRT. I think I would be an advocate of wearing a uniform to work, or perhaps “color days”. Monday is blue, Tuesday red, etc. Remove the thinking about getting dressed in the morning and save me 2 minutes (more time to sleep). Now I could do this on my own, but I think one person actively pursuing a color coded week would stand out. It would probably turn into a big joke. But if, for the most part, everyone participated, it wouldn’t be so odd. My GE fridge has been bothering me for the last year. It’s an older model (mid-90s) side by side and I was having issues with the refrigerator door. The door was not closing by itself and was having issues staying shut. Some mornings I would come downstairs to find the door slightly open. I had noticed that the door didn’t align correctly, but that seemed to be more of a cosmetic problem. The more I looked into it, the more I realized the cockeyed door was a symptom of the larger issue. There are two cam risers on the bottom hinge of the door that raise and lower the door. These cams help close the door and align the door to meet the fridge opening when fully closed. As I dug around, I found others with the same story and what appeared to be an easy fix. The cams, being plastic, wear out and break over time. I suspected I was missing both cams. Small pieces of black plastic on the floor around your door is a good indication of wear/breaks in the cam. 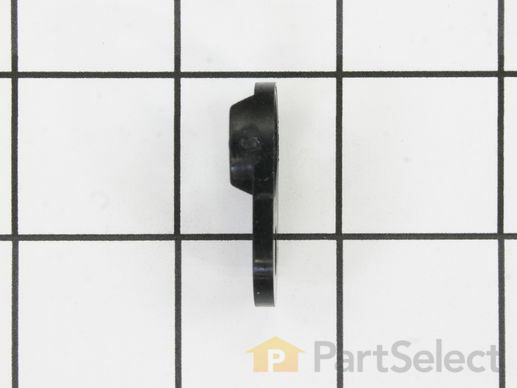 I found the part I believed I needed here, http://www.partselect.com/PartDetail.aspx?Inventory=297995&imgID=1, but needing 2 at $10 each seemed steep for a small piece of plastic. I ended up ordering my parts here https://www.appliancezone.com/ShowProduct.aspx?ID=10122 for $0.99 plus $6 to ship. I ordered 2, but each 0.99 package contained 2 risers (so I got 4). I followed the steps that others outlined on the PartSelect site and had a nice new fridge that closes itself, stays closed, and looks better too. Removed all items from door storage. Removed top hinge cover held by single screw and top hinge plate held by two bolts. Lifted up door to clear bottom hinge pin and removed door. Turned door upside down and removed bottom hinge assembly held on by two bolts. Replaced upper cam located on bottom of door and screwed the hinge assembly back on to bottom of door. Drilled out the rivet that holds the lower cam to the bottom hinge pin. Removed old lower cam and and replaced with new cam and secured to lower hinge assembly with pan head screw and nut (instead of rivet). NOTE: The metal shim that goes between the cam riser & door was also broken, we used a small washer instead of the replacement shim. Replaced door back onto lower hinge pin and secured upper hinge pin with original bolts. Placed cover on upper hinge assembly and secured with original screw.